The perfect moisturizer for hard working hands: everyone loves it from farmers to people who gesticulate. It s our most intensive hand treatment with ingredients that offer healing benefits. A great multi-purpose salve that can be used on hands, heels and elbows. Attractive tin. Absorbs better than many salves. An effective treatment for dry hands. Contains essential oils (lavender, eucalyptus and rosemary) that are very soothing if you have sore, achy hands. Good value for money as a little goes a long way. The tin can be tricky to open. A moisturizing and soothing salve that's great for dry, sore hands. I love this hand salve,the product comes in a handy tin and has a great picture on the front of it. The first thing you notice upon opening is the menthol type scent,it really wakes up the senses. The balm is easy to pick up onto fingers and rub into hands. It feels really refreshing and leaves your hands silky soft and protected all day. Burts bees is a fantastic brand and i love it! A wonderful light, easy to use hand salve. I originally got this for my Mum as she really loves Burt's Bees and this was in a set I got her. The tin was really easy to open and the salve was easily enough to spread over the hands, leaving them really soft. You only need a little of the salve and it works so well. 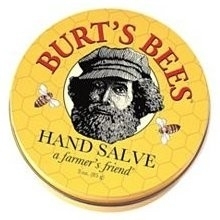 One of the best out there, can not beat good old Burt's Bees! "A great multi-purpose salve that can be used on hands, heels and elbows."